Just because it’s broken doesn't mean it’s not valuable! Sell scrap gold here! 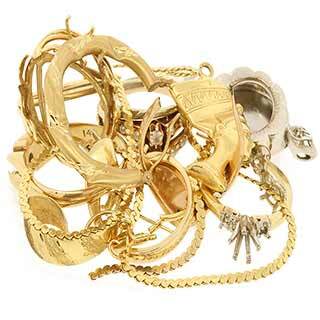 If you look through your jewelry box, likely you will find dented bangles, broken gold chains, single earrings and other damaged gold jewelry. The good news is, gold is gold and the weight of the actual metal is what gives it value. You can sell scrap gold for hundreds and even thousands of dollars! If you know the weight and karat of your gold, we can give you an exact buy price! Gather every piece of gold jewelry you can find, check with friends and family too. The more scrap gold you can sell at once, the more money you will receive. In fact, if you have several ounces of scrap gold to sell, we will increase our purchase price to 80% or even better! It is best to check with everyone you know when you are ready to sell your scrap gold because selling only a few grams like one earring or one thin broken chain is not enough to make an appointment. Please gather a small pile of broken and unwanted gold and give us a call. Your scrap gold value is determined based on the current spot price of gold. For example, with gold at $1300 per ounce, one gram of 14k gold will be purchased for around $18. A higher purity gold such as 18k will sell for about $24 per gram. Please note that scrap gold is often purchased in pennyweight (DWT). Most dealers will price your items in dwt. With gold at $1300, we would pay about $28/dwt and for 18k we would pay $37/dwt. When its time to sell scrap gold jewelry, Cook County Buyers delivers! Cook County Buyers can literally deliver cash to your door! Not only do we have a private office in Skokie, we also will come to your public location of choice. That coffee shop just down the block from you is perfect! Call Mike today to set up a meeting.